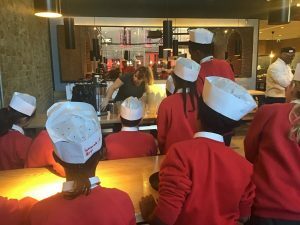 On Monday, Year 5 visited Wagamama. 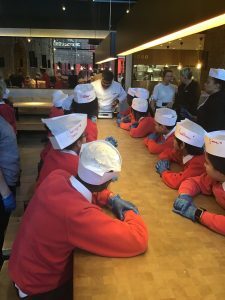 We had a great time there and learnt a lot about food hygiene, where food comes from and how to cook safely. Year 5 – comment in the space below and let me know what was your favourite thing about the trip. My favourite thing that I did at wagamama was when we made our food – and ate them. Did you know that the remains of the things that are in the blender is used as compost! I recommend that you go to wagamama – their food is so tasty! 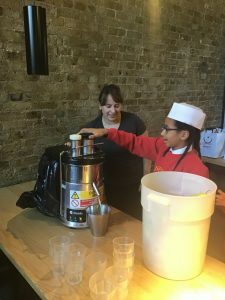 My favourite thing about the trip to Wagamama was that we got to make a carrot and apple drink in a phonominal machine that you put fruit in and a yummy carrot or apple drink will come out depending on what fruit you put in it. 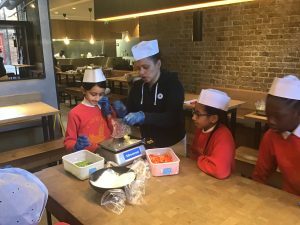 At wagamamas my favourite thing to do was making carrot juice & apple juice the carrot juice was definitely not my favourite juice to drink I also liked watching the chefs cook the stir fry with noodles. At wagamamas my favourite thing to do was make the apple & carrot juice the carrot juice was definitely not my favourite juice to drink. 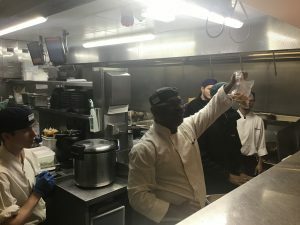 My favorite part was when I got to eat the delicious food (stir fry) only because of the fabulous chefs that made it for us and I thank all of the staff that came in and opened earlier so we could visit. My favourite part was all the smells. I was surprised to learn how accurate they are with the ingredients as I thought they may just use a rough amount. 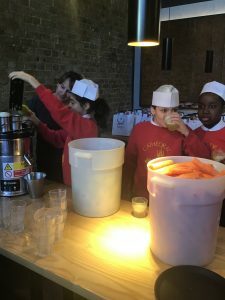 My most favourite thing I did was to make apple and carrot juice. It was the best! My favorite part of this trip was measuring out the food. 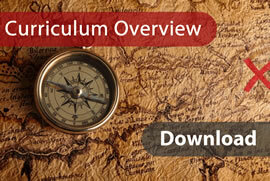 It helped me work out in maths when doing units of measure and comparing. 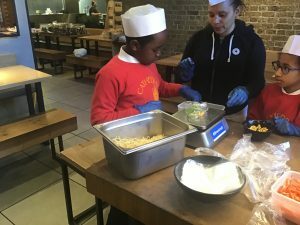 I also liked the idea of us making our food because I never knew that we were going to eat the food that we just made. The food was smashing!!!! The staff at the Wagamama were really nice, they were also all from all different parts of the world and I really liked that. If you had the same people in one restaurant it would be very boring because maybe they might help you learn that language but if you were all English you wouldn’t be able to teach each other different languages. Our trip to Wagamama was really fun and exciting. When we got there I thought we were going to do something boring but then we got to measure the food accurately so every one had an equally amount of food. I really enjoyed it when we saw the cooks cook the food the smell of the amazing food was so incredible. We squashed juices with apples and carrots and they tasted really outstanding. Thank you Miss Henderson for planning this trip for us we had an amazing time. Thank you so much for letting us come to your restaurant at a very early time. We really do appereciate you opening your restaurant at nine not at half ten. Your food is amazing and you should carry on making continental foods. Ignore all of the people who dislike your foods as your foods are phenomenal. The amazing thing about your restaurant is how you accept everyone for who they are whether they’re gluten-free, vegetarian or anything else and also the way you also accept people from any county they come from. Like Sameer who comes from India and everyone else. Also another great inspiration to other cafés and restaurants is the way you give certain colours to certain people. Not just in a way of randomising the colours not like you have green you have red exetra. Your chefs and cooks have to earn their colours. You start at blue then green then red then finally black which is the head chef like Sameer. 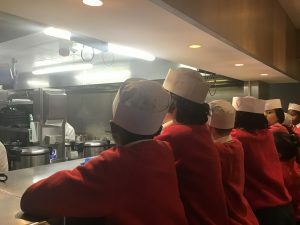 Hmm… I wonder if I and Class 5 could pass as a Sous Chef or a Junior Sous Chef? 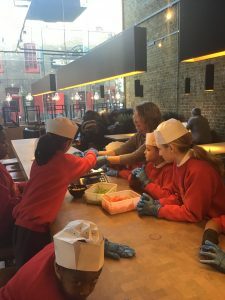 Thank you so so so so so much for inviting us to Wagamama’s it was such a fun educational trip for us. You are the best restaurant ever! 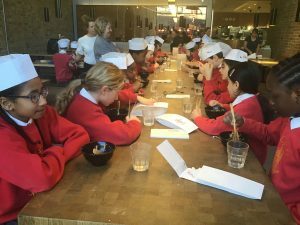 My favourite part of the trip was when we got to see how the chefs at Wagamama stir-fried the noodles for us to eat. I really enjoyed eating at Wagamama for the first time and I look forward to coming to Wagamama again. My favrat bit about wagamamas was when we squesed are fresh juses and of cours when we had the noodles! My favourite part of the trip was when we drank the apple juice because it was so fresh. 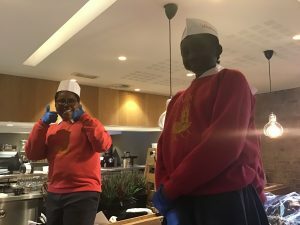 My favorite part in the trip to wagamamas was when we watched the cooks prepare the food for us, the sizzles and the sound of the frying pan and the noodles was an amazing experience.It was an amazing trip and I hope to go back to wagamamas another day I would rate this trip 5 out of 10 stars. I really enjoyed the trip miss Henderson and Janet, I really appreciate you taking the time to organise the trip thank you so much! I really enjoyed the trip Miss Henderson and Janet I really do appreciate you guys taking the time to organise this trip! Thank you! 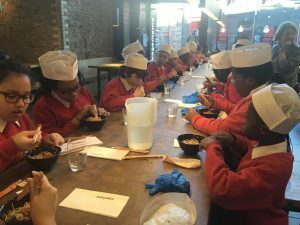 I really loved the trip to Wagamama as we got to learn important things about hygiene and we got to weigh noodles, sweetcorn and vegetables. 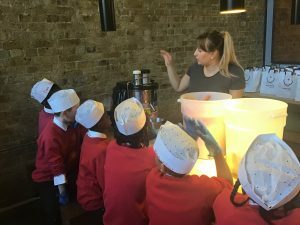 We also got to learn how to make apple and carrot juice. The trip was really enjoyable. 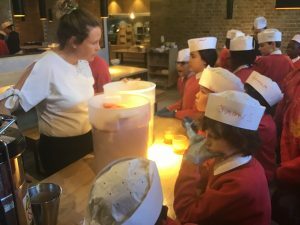 Miss Henderson , my favourite bit of the trip was portioning out the food so our Head chef would make our food to perfection!??? ?It was wonderful thanks for taking us. My favourite thing to do was making to juice. Tasting the carrot juice was terrible! I think the apple juice was better by alot. Squashing it was alot of work. I finally know how all of the delicious fruit juices. My favourite thing at Wagamamas was when we made the juice beacause I enjoyed drinking carrot and apple juice. I also enjoyed eating the food at Wagamamas it was so delicious it was scrumpdiliumtious. The noodles were the best they were professional and vegetables were nice I’m starting to like them now. You’ve inspired me in many ways I might want to be a chef when i am older or sell carrot and apple drinks in the summer. And you opened Wagamamas early just for us we really appreciate that we had a lovely time at Wagamamas. My favourite thing we did in Wagamama was when we got to drink the apple juice and carrot juice. I really enjoyed going to Wagamama. It was fun and exciting. 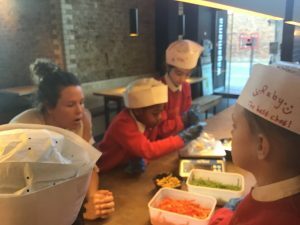 We learned about hygiene and what the different colour hats they wear in Wagamama. My favourite thing that we did there was making the fruits in the machine, then crushing it with the tube. When we ate the food it was delicious, most the people wanted seconds!